It is our goal at Annapolis Brothers Power Washing in Glen Burnie Md 21062, to keep beautifying every residential and commercial property in town. Our attention to detail, outstanding customer service, and expert use of commercial grade equipment, ensures that you will receive the most thorough and long-lasting results- 100% Satisfaction Guaranteed! Call our certified team today to receive a free estimate! With over 15 years Annapolis Brothers has been a full service exterior maintenance company offering reliable, efficient and high quality exterior cleaning, including pressure washing, soft washing, low pressure and other cleaning services to residential and commercial customers in Maryland. We use only the highest quality products and modern, professional equipment, to ensure you receive the most efficient and long lasting cleaning results. We are proud to say we are Top Rated Power Washers in Glen Burnie Md. Each of our employees are professionally trained and dedicated to giving each client a clean and healthier home. We firmly stand behind our 100% complete satisfaction guarantee. If you are not happy, we aren’t either. One of the things that we pride ourselves on is being able to offer a variety of services. We know you have more service needs than just power washing or just pressure cleaning your home in Glen Burnie Md. We want to make it easy for our clients and be your one-stop shop for the majority of common tasks requested for exterior cleaning and property improvement work. Sidewalk cleaning, roof washing, mold removal and we’ll even clean your window sills and screens. Contact our team to schedule an appointment with us today. It’s a fact that your house and property are your most important investment. In order to keep your investment healthy, regular maintenance is required. Annapolis Brothers Power Washing in Glen Burnie Md can help. Whether you plan on staying in your home for years to come, or plan on selling it soon, curb appeal is always important. Our trained pressure washing technicians will clean and protect your property from harmful containments, enhancing its curb appeal while increasing value. Soft washing is a low pressure cleaning method that safely kills and removes all algae, mold, dirt, and grime on your home’s exterior surfaces. It will help avoid wood rot and prolong the life of the paint. One of our skilled technicians will come to your home or business in Glen Burnie Md to give you a free estimate and inform you if soft washing or pressure cleaning will be the best method for you. After accepting the estimate, we will get you put on our schedule at a time when it is convenient for you. After the initial job is completed, we will follow up with you for a regular cleaning maintenance call. 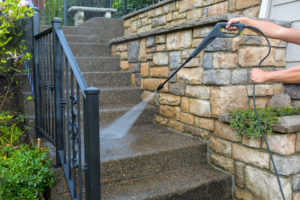 It is extremely important for the health of your property to allow the professionals in Glen Burnie Md, to perform exterior washing services regularly. Regular routine maintenance includes: Roof cleaning, Gutter Cleaning, Window Washing and Exterior Pressure Washing, to remove mold, dirt and other pollutants. Annapolis Brothers Power Washing offers 5 star exterior washing services. Each employee is highly qualified, professionally trained and insured. We use state of the art equipment and cleaning methods that will leave your exterior surfaces spot and dirt free. Join your neighbors in Glen Burnie Md today and hire the towns #1 Trusted power washers! There is more to turning on a pressure cleaner and adjusting the water pressure. It is critical for the washing process to have the proper detergent type and strength. Using the wrong technique can permanently damage your residential or commercial’s property, surface, landscaping and concrete. This will cause you more work, and costly repairs. So, save yourself the time, energy, and extra costs, and hire your local power washers of Glen Burnie Md. We will get the job done. Members of our crew are skilled and polite, always respecting your property and belongings. Our exterior home washing techs will show up promptly, communicate with you what services you will receive and will be happy to answer any questions you may have. Customer service is everything to us. We want to make sure that you are getting the best services possible. 100% customer satisfaction guaranteed. From the moment you schedule a free estimate with us we pledge that it will be a smooth process from there. We are extremely dedicated to the satisfaction of every customer in Glen Burnie Maryland and will not leave until we know the service provided is complete. Each of our employees are trained to use our patented equipment and how to apply the best techniques for multiple residential and commercial surfaces. All our cleaning agents are environmentally safe and will keep your property cleaner longer. Call our team today to schedule your next appointment! If you are looking for a reliable company to get the job done right the first time, these are your guys! They do stupendous work and are very trustworthy, we have been using them for years. My store front was in desperate need of some TLC, and these guys helped me out! They power washed the front of my building, cleaned the windows, and cleaned the walkways. I am so impressed with this company, i will be recommending them to everyone. My neighbor recommended me to this company, and im so happy she did! The team showed up promptly and did an incredible job cleaning my patio and driveway! Great company to deal with, easy communication and affordable prices! We are very impressed with how fast this company came to our home, cleaned our roof and siding, and how well it turned out! Our home looks fresh and clean. We will be calling again.